Deletion of Deductee’s records (in Correction Return) is no longer permitted. Till the prior FVU versions Deductee records could be deleted, while filing the Correction Return. Form 27A is used for providing summarized information with the Statement of Tax deduction/Tax Collection at source. Going ahead transactions, on which tax is deducted prior to the filing period, cannot be included in the TDS return. Now on, a Deductor is required to file a Correction return, if they have any (such) transaction relating to previous filing periods. Challan amount should be more than or equal to total of Tax deducted, interest payments, late filing fees and other amounts. The process of registration and login on new web site TRACES is different from the earlier one on TIN web site. Address will be populated from TAN database, but can be modified . On clicking Confirm, the process of registration will be over. An activation screen will appear and you need to enter User ID and activation code as sent through email and sms. TRACES : new TDS web interface from Income-tax Dept. 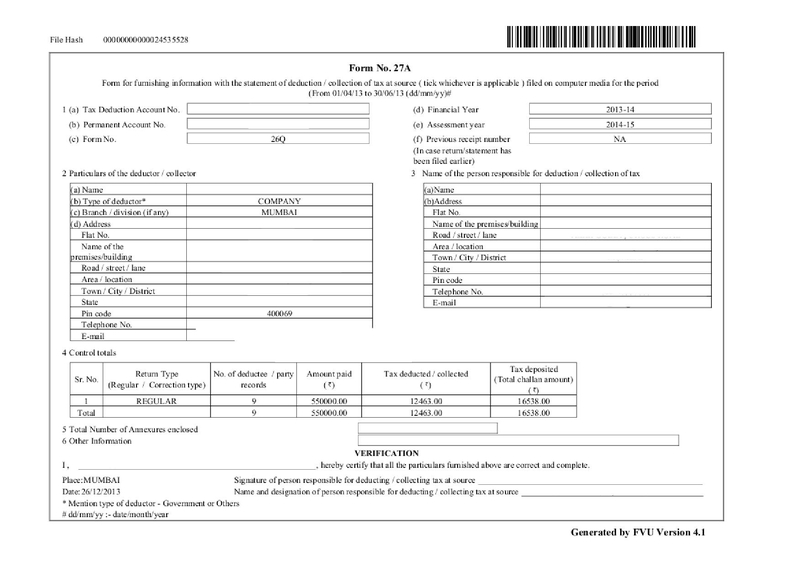 December 13, 2012 5:08 PM / 599 Comments on TRACES : new TDS web interface from Income-tax Dept. TRACES stands for TDS Reconciliation Analysis and Correction Enabling System and has been set up by TDS Centralised Processing Cell of the income-tax department.